Clutch cable free play "a" Out of specification Adjust. a. Pull back the rubber cover "1" b. Loosen the locknut "2". 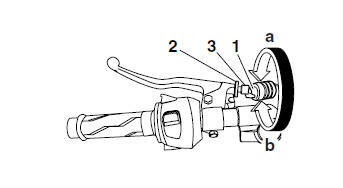 c. Turn the adjusting bolt "3" in direction "a" or "b" until the specified clutch cable free play is obtained. e. Place the rubber cover in its original position. If the specified clutch cable free play cannot be obtained on the handlebar end of the cable, use the adjusting nut on the engine end. Left lower side cowling Refer to "GENERAL CHASSIS" on page 4-1.
b. 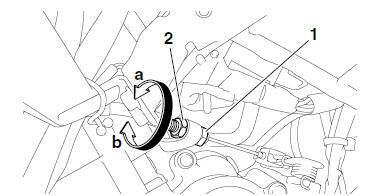 Turn the adjusting nut "2" in direction "a" or "b" until the specified clutch cable free play is obtained.